Hundreds of people were forced to flee their homes after a wildfire broke out in the Texas panhandle. The fire started around 4 p.m. Sunday (5 p.m. ET) near Fritch in Hutchinson County. It destroyed more than 100 homes and continued to rage into the night despite being 75 per cent contained by firefighters. Leggett said that between 300 and 400 people had been forced to leave their houses in the surrounding area of Fritch and an unknown number were without power. Officials had considered evacuating the 2,100-population city itself but decided late Sunday it was not necessary. There were no deaths or injuries related to the blaze, the police chief added. Every fire department in Hutchinson County was called to the blaze and people were evacuated to at least three schools and churches being used for shelter across the area. "Words cannot express the sadness and fear you have for the people’s homes, belongings and lives," Vicki Bybee, one of the evacuees, told the Amarillo Globe News. 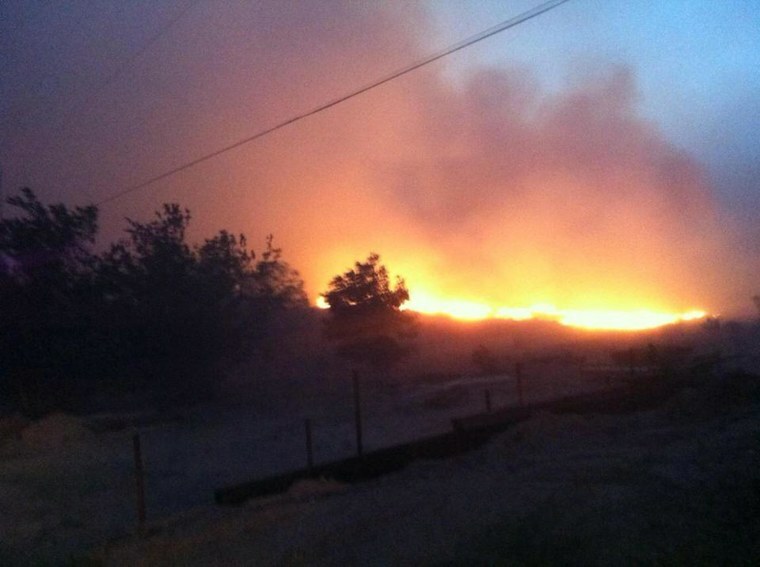 The blaze had consumed more than 1,500 acres and around 100 emergency service personnel were on the ground battling to contain it as of 4:30 a.m. local time. The Texas Forestry Service was scheduled to assist the effort with water drops from two aircraft on Monday, Leggett added.